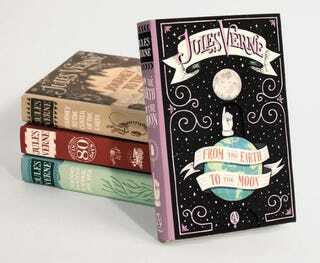 Illustrator Jim Tierney has designed a series of interactive covers for Jules Verne's most cherished novels. Wave-shaped dust jackets for 20,000 Leagues Under the Sea? Pop-up spaceships for From the Earth to the Moon? Yes, please. For his senior project, University of the Arts student Jim Tierney reimagined the covers of Jules Verne's 20,000 Leagues Under The Sea, From the Earth to the Moon, Journey To The Center of The Earth, and Around The World in 80 Days. The below video showcases his design process, and his preliminary sketches are available at Faceout Books.